Operating System: Windows, MAC, iOS, and Android. 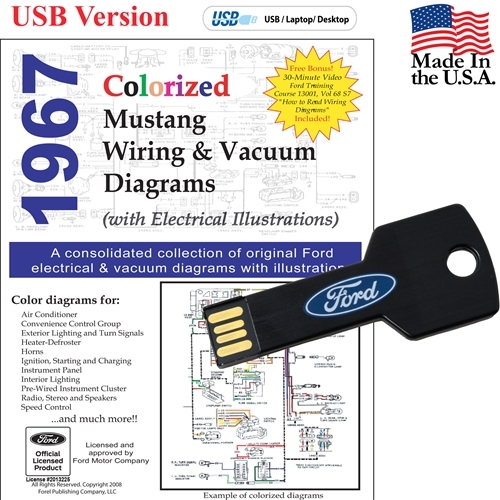 Description: The 1967 Colorized Mustang Wiring and Vacuum Diagrams manual contains a complete and comprehensive collection of wiring diagrams, schematics, and electrical illustrations. Each diagram and illustration is from an original Ford Motor Company publication and are the same manuals used by Ford technicians to troubleshoot electrical repairs. Unlike the B/W manuals on the market, the wiring diagrams in this manual have been carefully color coded to make it easier when tracing electrical lines. Ford Training manual "How to Read Wiring Diagrams"
Free Bonus! You also get a 30-Minute Video Ford Training Course 13001, Vol 68 S7 "How to Read Wiring Diagrams"
Our products are licensed and approved by the Ford Motor Company. All products are produced in Adobe Reader (pdf) format to retain the exact look and feel of the original manual. Simply scroll through the pages and sections like reading a normal printed manual. In addition, unlike a printed version, each page can be printed (or reprinted, if damaged in the garage), zoom in to over 1200% to see the exact details, and you can search for keywords. Licensed - Our products are approved and licensed by Ford Motor Company. Bookmarked - Manual is bookmarked to locate sections in seconds. Money Back Guarantee - We stand behind the quality of our products. Encrypted PDF - PDF file is encrypted and can only be viewed when activated. Activation Required - Product may be activated on three (3) computers. Windows, MAC, iOS, and Android - also now transportable to USB devices.